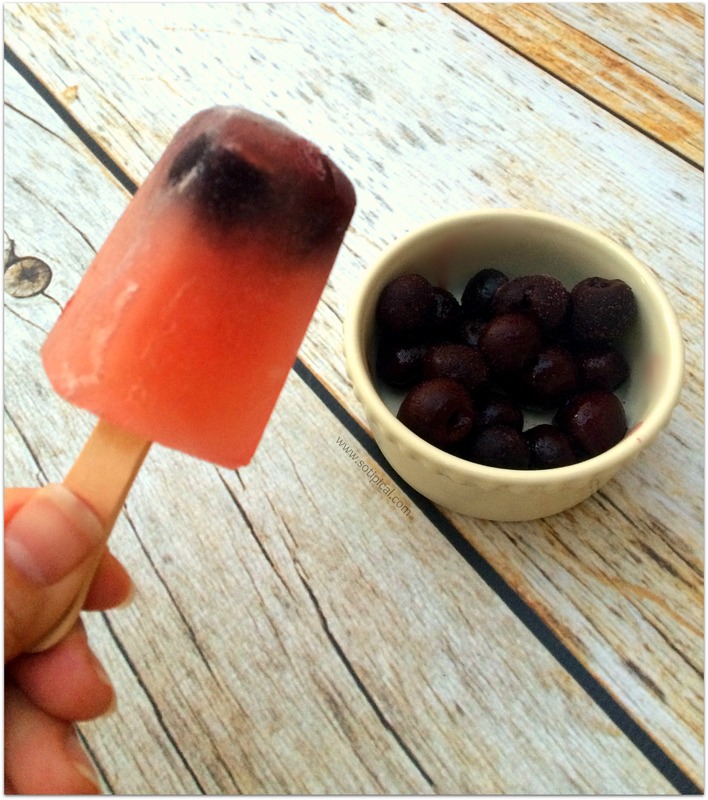 Happy hour just got cooler with these Limoncello Cherry Bomb Popsicles! A perfect balance of tart lemon and sweet cherries with a little kick! So cool and refreshing! Its been pretty warm here so I was looking for a light and frosty dessert option to serve at a dinner party. Very often we like to have a small sweet after dinner, but sometimes other dessert options seem to heavy when its hot out. We make popsicles for the kids all the time, so I decided that I would make some for just the grownups, that were a little smaller and a little less sweet. 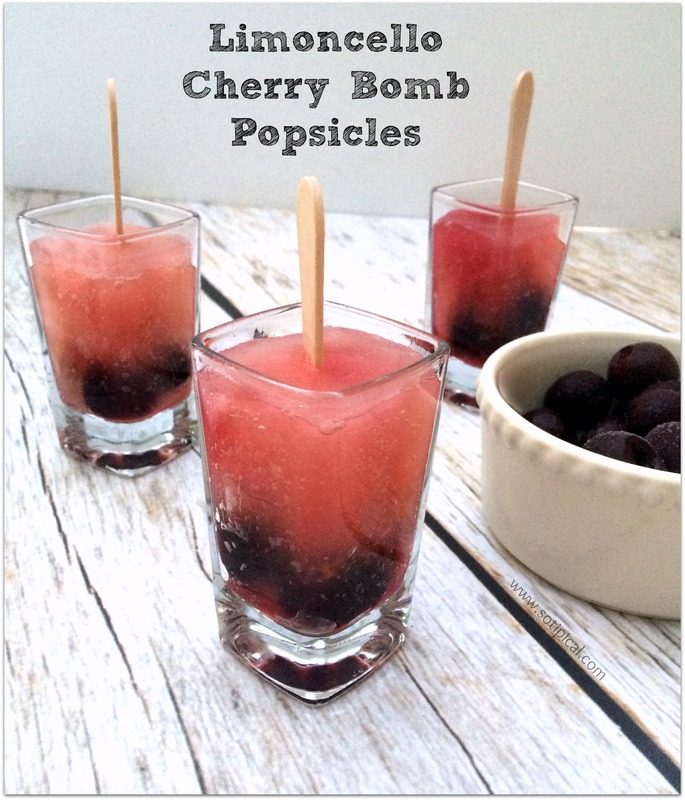 Begin by making the Cherry Bombs. They are often made by soaking Maraschino cherries in rum. Instead, I soaked frozen, pitted black cherries in vodka for about 3-4 hours. For this recipe I made an individual cup of lemonade, but you can use any kind you like. I used the juice of 1/2 lemon, water and honey. Honey takes a little longer to dissolve, but I prefer it over sugar. Once my lemonade was ready, I added 3 TBSP of Limoncello. If you haven’t had Limoncello before, its an Italian Liqueur that is often served after a heavy Italian meal as a digestive aid. In your shooter glasses, place about 3 cherries at the bottom with just a tiny drizzle of the juice remaining in the bowl of cherries. Carefully pour the lemonade over the cherries and fill the glasses. Put the filled glasses in a square or rectangle plastic storage container to keep them from sliding around in the freezer. We have a bottom freezer drawer and I was concerned that pulling open the drawer would move them around too much or perhaps fall over. Push the glasses together and cover with plastic wrap. Insert a popsicle stick through the middle and push down into the glasses. This will help keep the sticks in place and not droop over. Freeze 3-4 hours or until solid. When you’re ready to enjoy them, place the glass (very briefly) in a small bowl of warm water. This will help to remove them from the glass without breaking. Or, you can run the bottom portion of the glass under warm running water instead. They were really delicious and refreshing. I found that these were just the perfect size too. Sometimes the other molds I have are a little too much for me and I don’t always finish them. These can also be made without the alcohol or even with Limeade, if you love Cherry Limeade! How would you make them? Tell me in the comments! How do you get them to freeze? Just curious how they stand up, because I keep my vodka in the freezer and it doesn’t get frozen. These sound so tasty, I’d love to try them! Ann, I only soaked the cherries in the vodka. I didn’t use it in the lemonade. There was only 3 TBSP of the Limoncello in the lemonade so it was able to freeze. Loving these happy hour popsicles!!! Thanks Claire! Hope you enjoy them! Thanks Mary! Hope you try them! So yummy! What an awesome idea Christine! My friends are so going to love these. Thanks so much for sharing this recipe with all of our Let’s Get Real readers. These sound FANTASTIC! So refreshing! These look great, would be all over them for a party cocktail!! 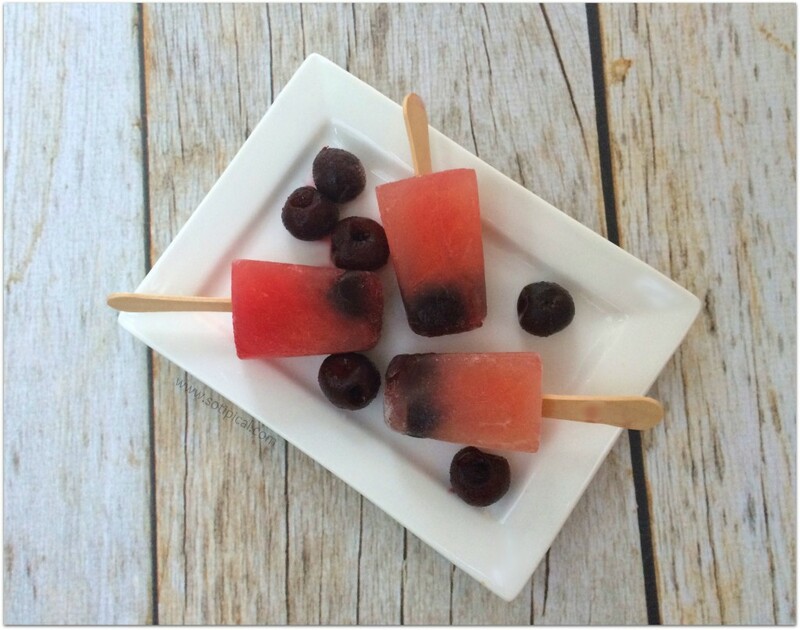 These popsicles look amazing!! It is SO hot here at the moment so these would go down a treat! Oh my! These look and sound so good!!! What a great way to start Spring! So can’t wait! Thanks for this yummy idea!! !